Japanese Levitating Magnet Trains Coming to US? Japanese maglev trains whisk across the country regularly at speeds of 310 mph. Compared to the fastest passenger trains in the United States, which travel at top speeds of 110 mph and average 80 mph, you can travel three to four times faster. Prime Minister Abe Shinzo is pushing for America to invest in magnetic levitating trains—proposing to fund the first 40 miles of track in the United States. But will this investment be good for the country? Well, consider this: you can reduce the trip from New York to Washington, D.C., from three hours to one. You could leave New York at 7 a.m., and arrive in Washington at 8 a.m. The maglev could prove to be a very attractive option to get around New York traffic and congestion. The company Northeast Maglev is leading the U.S. maglev development and working with policy makers and experts to make maglev into a reality. The advisory board is led by Senate Majority Leader Tom Daschle, and consists of governors, CEOs, and policy makers—such as former Secretaries of Transportation Mary Peters and Rodney Slater. The team backing it is strong, but the cost is disheartening. The Washington Post reports that $50 million in funding has been raised by the Northeast Maglev. 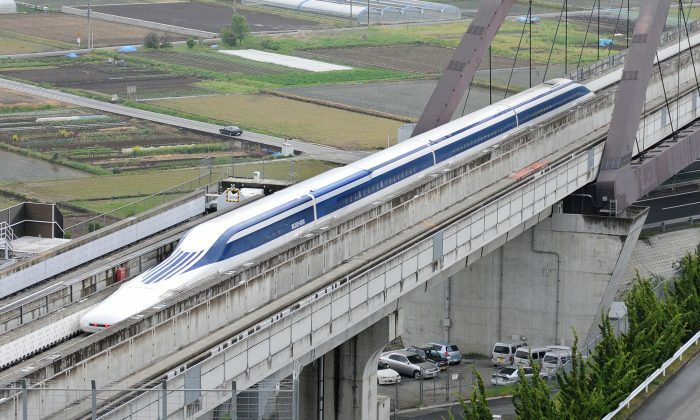 In Japan, the 320-mile maglev line from Tokyo to Osaka cost $116 billion to build. Similarly, Amtrak estimates a line from New York to Washington, D.C., would cost around $110 billion.